I recently had the night to myself. A dear friend of ours is fighting cancer and she asked Chris to come down and make dinner. When Chris called and told me her plans, I would never complain. You have to be there for your friends when they need you. In addition to some of Chris’s home cooked food Jen was craving a nice glass of wine and I told her that “We have a full Cellar, why don’t you bring her something nice”. An hour later Chris was home, packed up a few food items, a bottle of wine and she was gone. I spent the entire afternoon in meetings and I was getting pretty hungry myself. Not knowing what I was going to eat, between meetings I checked out the freezer and I had myself a frozen pepperoni pizza. I’m not a fan of frozen pizzas so I decided to doctor it up like Chris would have done if she were home. I grabbed a few a small sweet red and orange peppers, some jalapeno peppers, pickled peppers, some seasoning and more mozzarella cheese. I was happy. 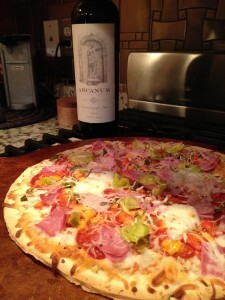 There is one more element that pairs well with pizza is a glass of Italian wine. I have a couple of sections in my cellar just for Italian wines so after I pulled a few bottles, I decided on a Super Tuscan style. I’m sure some of you thought a Sangiovese would pair better, but I believe that the best wines with food are the ones that you like. 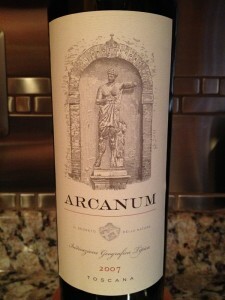 I decided to have the 2007 Arcanum. Indicazione geografica tipica is the second of four classifications of wine recognized by the government of Italy. Created to recognize the unusually high quality of the class of wines known as Super Tuscans, IGT wines are labeled with the locality of their creation, but do not meet the requirements of the stricter DOC or DOCG designations, which are generally intended to protect traditional wine formulations such as Chianti or Barolo. It is considered broadly equivalent to the French vin de pays designation, and in the Valle d’Aosta Vin de pays may appear on the label in place of Indicazione geografica tipica. Similarly, in the province of South Tyrol, the term Landwein may be used as a synonym. Since I do not know Italian I also did a quick search on some of the words on the front label. The Super Tuscan wine had a deep color depth in the glass. The hue was purple and it was clear. The Arcanum was very aromatic smelling slightly earthy but fruity and young. I noted oak, spice, and sweet dark cherry smelling a bit earthy. 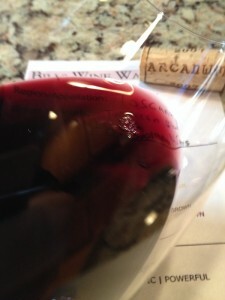 The Arcanum was not dry and it’s acidity was lively and full-bodied. The tannins were medium and soft and it was very flavorful. There was no dominant flavor, however it had a soft and silky start with a slight green pepper finish. The wine was very complex and balanced with a long finish. Blend. 51% Cabernet Franc, 32% Merlot and, 17% Cabernet Sauvignon. How much: I think it was $90. 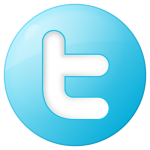 I rated the 2007 Arcanum Wine four stars. It was really good and paired well with my doctored up pizza.